The students are learning a lot of interesting facts about Lithuanian history during their classes. This Saturday teacher Povilas talked about the times of Gediminas and how unique Vilnius was during the middle ages (free from taxes, multi-cultural and open to many religious). He also showed clips from a documentary about Vilnius Castle, how it was built, what structures it had and it's defensive benefits. The 1st-3rd grades watched clips about the dream of Gediminas. Peledžiukai talked about the gifts of the fall. They talked about not only vegetables and fruit, but also Lithuanian berries. They glued together apples, chose favorite fruits and vegetables. Kindergarten students talked about night and day. The first graders talked about their families. They acted about the tale about the turnip. They talked about calendar, seasons, alphabet, color and shapes. They also talked about three words from the word tree: anthem, flag and freedom. 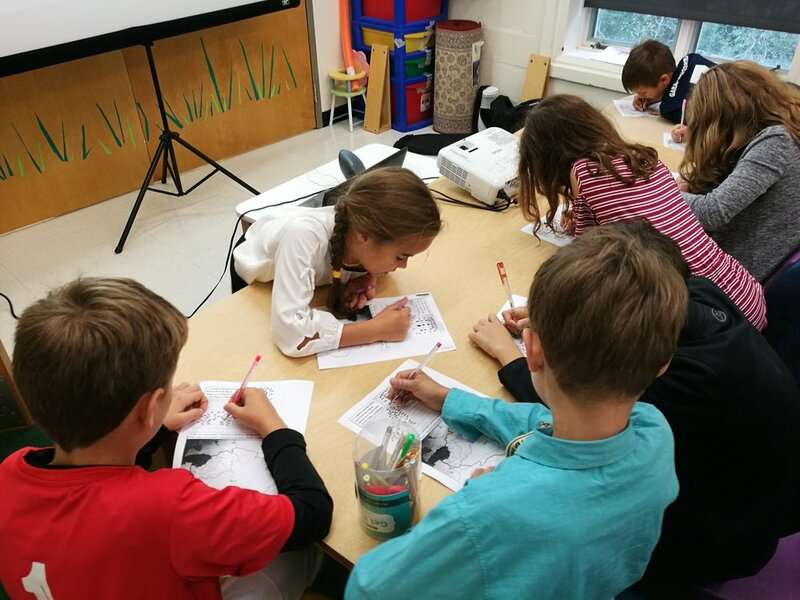 All of the students are illustrating a tale by J. Basanavičius. We also always find time to play around and sign a little.